If you’re planning on using your points and miles to take a solo trip to Greece or looking to explore the Cayman Islands by yourself, we suggest you do so vicariously through these female solo travelers first. These adventurous globetrotters show us just how liberating it is to travel alone. Not only that, but their Instagram accounts serve as go-to platforms for great travel guides, vacation ideas and tips for solo traveling in a safe and exciting way. Here are seven fearless female solo travelers to follow on Instagram. What: Gloria Atanmo is an adventure enthusiast who embraces every corner of the world as her home. Through 60-plus countries and across five continents, Atanmo is a living testament that you can have expensive dreams with an affordable hustle, as she puts it. Based out of her suitcase, she has mastered traveling on a shoestring budget. 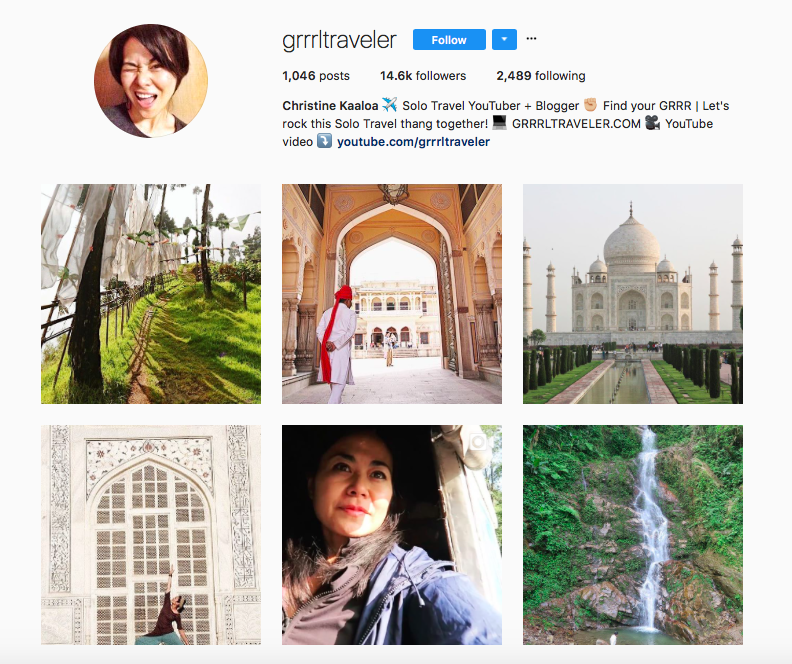 Her feed is a travel diary of all the popular locations (and off-beat destinations) that she visits around the world. Whether you’re a fellow globetrotter or you’ve never taken a flight in your life, Atanmo has something for everyone. Where You’ll Find Her: Snapping her way across five continents, 60 countries — and counting. What: Are you planning a trip to Southeast Asia? Well, then you should be following Christine Kaaloa. She left her life in New York as a reality TV camera operator and producer to live and work abroad in South Korea. After teaching in Korea for a year, Kaaloa traveled to different parts of the country each weekend and then decided to backpack through India and Nepal. Having discovered her “GRRR” while backpacking alone, Ka’aloa now indulges her appreciation for cultural diversity on her Instagram. 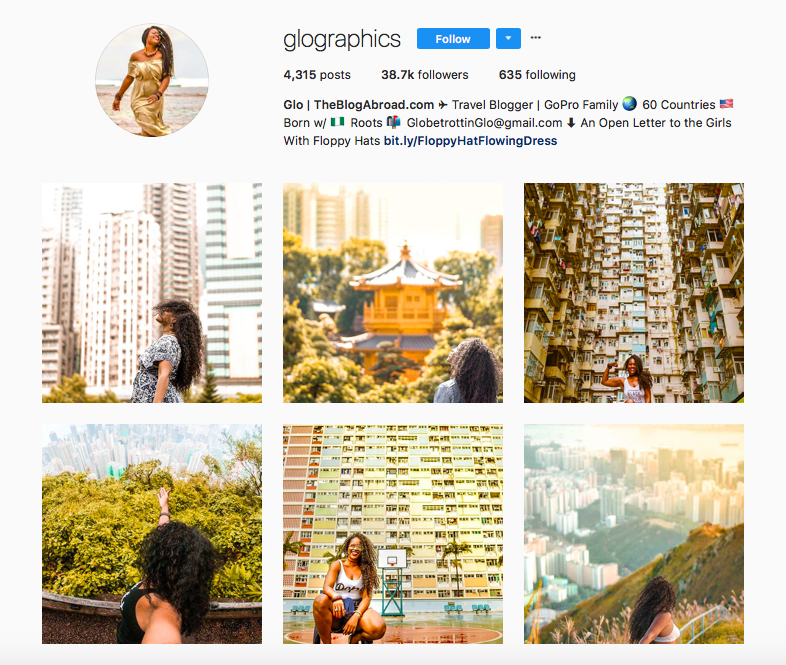 Each of her posts captures a moment in time that tells a different story — whether its a picture focused on landscape or the local communities she visits, her feed is a breath of fresh air. Where You’ll Find Her: Planning her next travel excursions from her home in Korea. 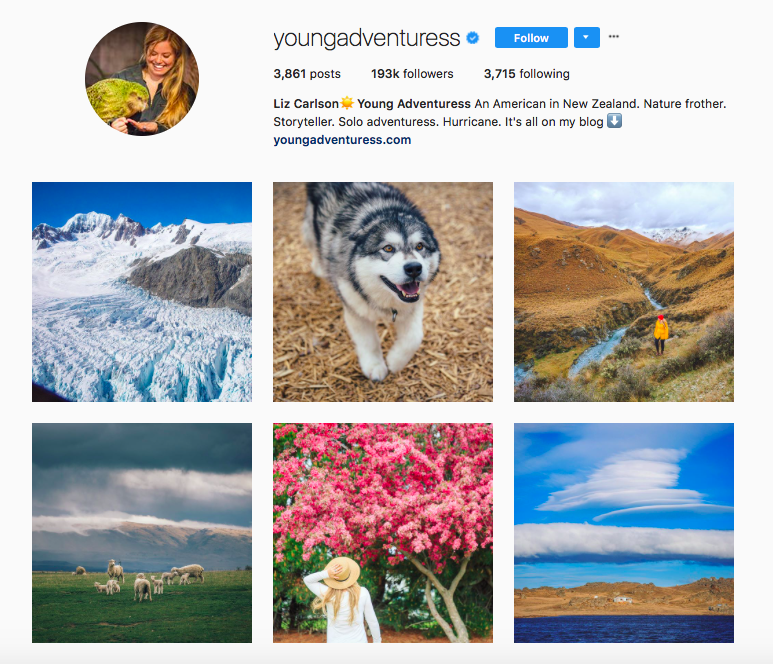 What: Liz Carlton traveled to over 40 countries within a 10-year period and uses her blog and Instagram as the ultimate Insta guide for any tourist looking for the most well-known places to see in New Zealand. This Virginia native moved to Spain for a few years, where her love for travel was born; she returned to the US for a short period of time before quitting her job and moving to New Zealand. This young adventurer shows no limit in her travel or photography. Her Insta feed boasts outdoor adventuring in the most inviting way: From snowy mountains to colorful meadows, you’ll see exactly why Carlton is a go-to in everything travel. Where You’ll Find Her: In the very Instagrammable mountain town of Wanaka, on the South Island of New Zealand, still blogging away and chasing adventure. What: It’s hard not to get lost in Brooke Saward’s Instagram feed, featuring a whirlwind of wanderlust-inducing photos. 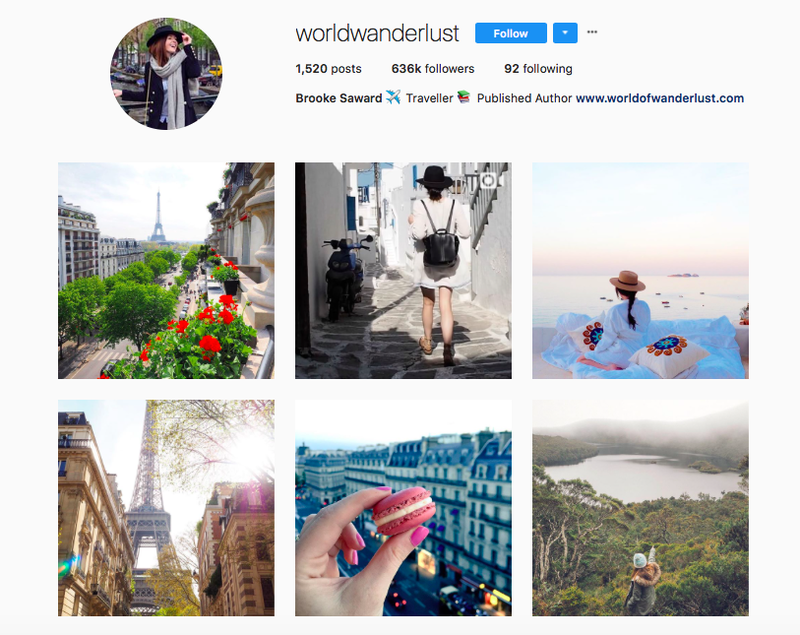 Just one look at her Instagram and you’ll think of two things: travel and sugar. This Australian blogger is widely known for her idyllic Instagram snaps dedicated to showing off her luxe travel and eating habits. Saward has been traveling since the age of 13 and has no plans of stopping anytime soon. Follow her through the local market in Mykonos to the cafes in Belgium, Saward takes us with her on every trip with a snap of a picture. Where You’ll Find Her: Traveling all over Europe — from Positano to Versailles. What: Jacintha Verdegaal is a Jetsetter that knows how to effortlessly capture her travel experiences. Originally from the Netherlands, Verdegaal moved from there to London where she began documenting her new life; she shows the best that any city has to offer with the framework of her photography. What’s more, she believes that exploring the local food culture is just as important as sightseeing. 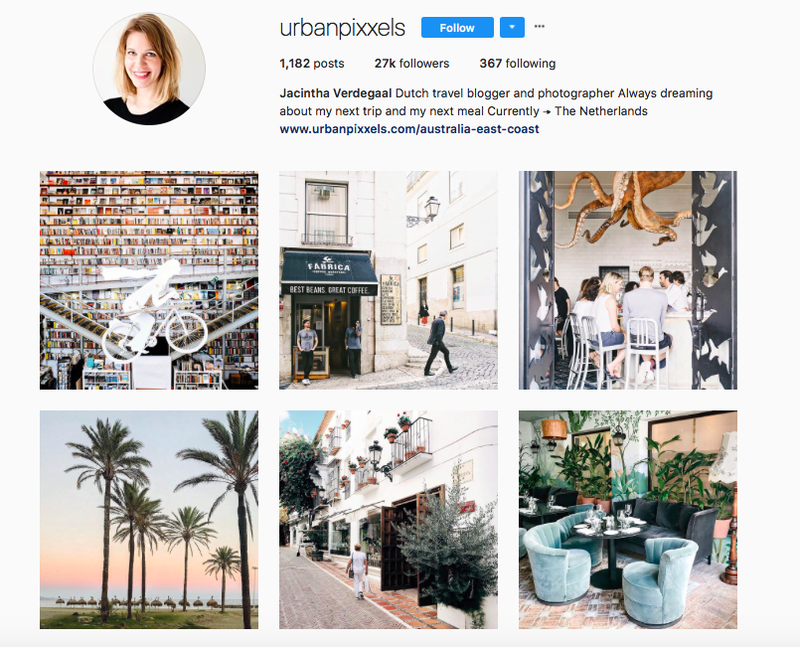 Her blog UrbanPixxels and IG posts are refreshing and seemingly new in how she captures the world around her. Focused mostly on landscape, Verdegaal’s occasional food post are just as great — leaving us wanting to travel the world with her. Where You’ll Find Her: Snapping across the Netherlands. What: Kiersten Rich’s Instagram is a curated collection of the most picturesque and idyllic destinations around the world. In 2011, she traded in her corporate finance career for a one-way ticket to Australia and a return flight home from New Zealand. 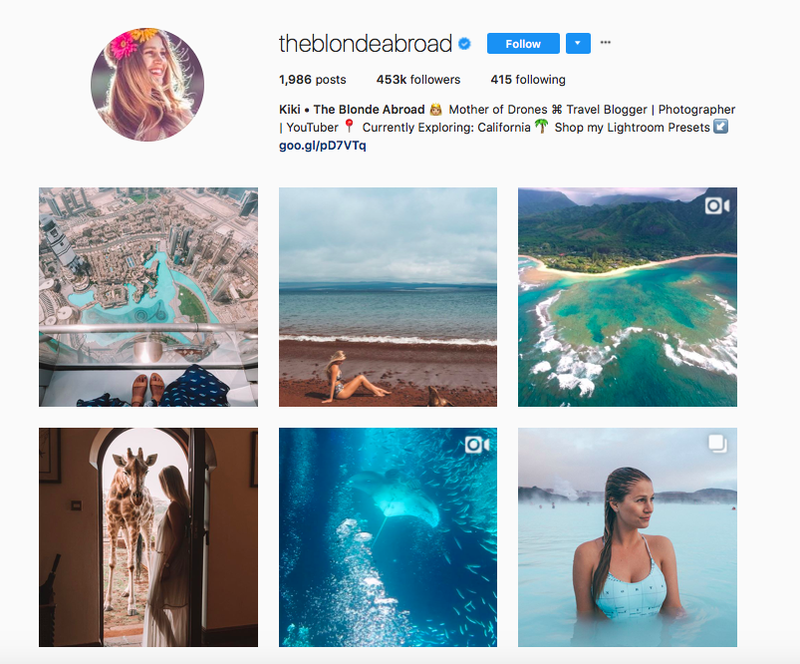 Five years later and she has traveled over 50 countries, gained more than 450,000 followers on Instagram and checked off some big adventures off her bucket list — and ours, as well. From the crystal clear waters in the Galapagos to the sand dunes in Abu Dhabi, you can trust Rich to give you the ultimate travel-envy through her Instagram. Follow her golden locks to your next possible travel adventure. Where You’ll Find Her: Exploring the blue skies and blue seas of California. 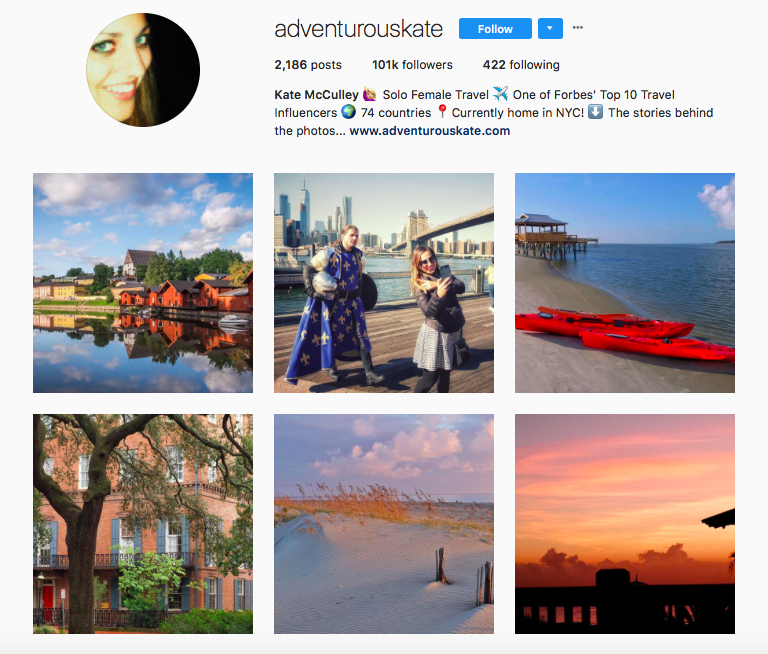 What: Kate McCulley was named one of Forbes’ Top 10 Travel Influencers and her travel list includes over 70 countries. Her ultimate goal? To show people how they can travel the world on their own all while showing us just how fun seeing the world can be. McCully’s adventurous attitude and passion of travel translates through her posts. If you’re a lover of beautiful beaches and riverfronts, McCulley’s travel snaps will have you planning your next vacation in no time. Where You’ll Find Her: Currently out and about in NYC.